Tricia, this is lovely! I can't believe you really struggled with it, because it flows so well. I love the change of mood from the first four lines to the final two (maybe a blank line between would give it even more impact--just a thought). Sorry you didn't enjoy the exercise, but I love what came out of it! And I didn’t hate it, just found it oh so frustrating. I’m sufficiently challenged to keep at it, though. Tricia.... This is a perfect poem! So it doesn't feel forced or challenged at all. And, I didn't know anything about the danphe! He's really just a pheasant, but he puts our boring North American species to shame. He's also the national bird of Nepal, so he's quite interesting. Of course, the female of the species can't compare. So typical in the bird world. You killed it! Extra points for all the research required. ;) Seriously, You got the right bird for those three words, and fit it into a beautiful little poem. What a GORGEOUS wee bird! And I think the spacing even emphasizes all the more what a sly looker this guy is -- you look, you pause, then you say more. I really think you nailed it, though you did not! This was hard for EVERYONE. This is excellent! I think you used "roof” perfectly. Despite your apologies, I think your poem is terrific--all three words work perfectly. Love the spike as mohawk, and the Himalayas as roof of the world. I actually like it very much, Tricia, and love that you found an animal where you can use "roof". That's clever! 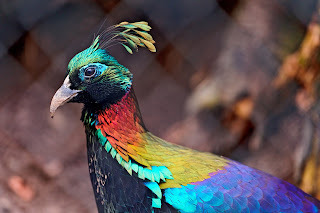 Since I shared an animal book today that introduced a few new animals, I also love hearing about some other unusual animals that are new to me like your beautiful Himalayan Monal. I think you did it quite well. I also wanted to say I love your triolet in The Poetry of US. On an old oak tree, which is visible from my roof, towards the west. And the company of family folks. The visual as if I am on a himalayan hike. What an incredible bird, I've never seen one before, and I love the way you worked "roof" into the poem! I agree with the above compliments...great poem for these words. You'd never know it was a toughie. That is one impressive looking bird--and your poem brings out his best side. Lovely job with the challenge. I've enjoyed reading the different offerings.